The Mountain King Cabin is an amazing place to call home during your visit to Yellowstone Park. 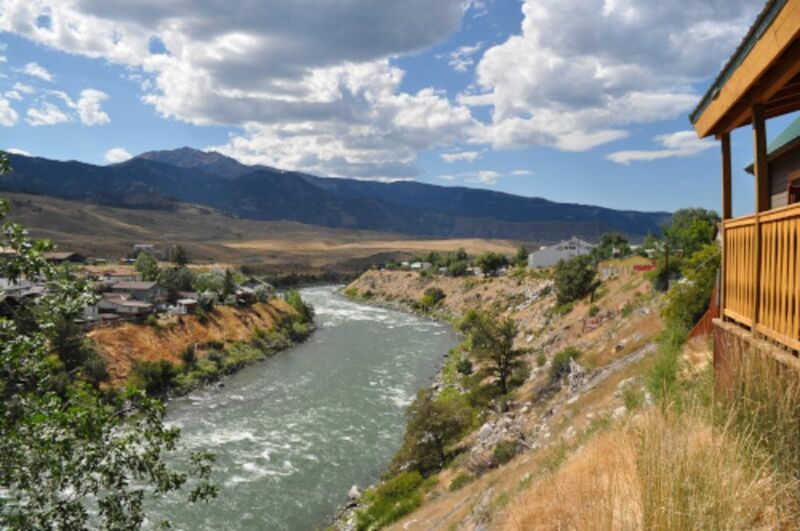 Located in the heart of Gardiner, on the banks of the Yellowstone River, it is just a mile from the north entrance to the park. The house faces south looking into the park highlighting stunning views of 11,000 foot Electric Peak. You can literally look out the windows, or off the deck and see: elk, antelope, deer, and occasionally bears and wolves roaming the hillsides of Yellowstone. This rustic Montana log cabin is an inviting, airy open space it's is great for groups 6-8 with a fun loft for the kids! The Mountain King has private river access shared with the raft company for you fishing buffs. Walk down the path and have your line in the water in minutes. This stretch of the Yellowstone is a local secret because there are very few ways to access it. This section is not fished by commercial drift boats, the fishing is exceptional. Stay in this beautiful cabin, AND spend a couple days rafting, horseback riding, and viewing wild life inside Yellowstone. It's easy and all in one place! Large groups can book our neighboring Yellowstone cabins the Eagles Nest and Grizzly Den.....perfect for multi-family vacations! Thank you for sharing our cozy space and supporting our family! You help make our dream to raise two little munchkins possible! Our passions are family, giving back to people and community, and playing outside! We hope that in your time here you love playing outside too! Airy and sunlight filled, this wood interior cabin is welcoming immediately! Dramatic scenic views off of the deck yet nestled in town for the perfect hum of a Yellowstone summer. Close to the park and walking distacne to all of Gardiner. For larger groups, rent the neighboring Grizzly Den cabin or Eagles Nest cabin. Great for family reunions or work groups! We can also help connect you to a park tours, raft trips, and even a massage! The Yellowstone River is directly below your deck - fall asleep to the sound of it rushing by. The boiling river in Yellowstone is a fifteen to twenty minute drive. Rafting and horse back rides and a picnic on Yellowstone lake are a must!